Going to the washroom built outside her house was once a real struggle for Labasa widow Maya Wati and her physi­cally-challenged daughter. Their washroom was detached from the main living quarters. And, when it rained, Ms Wati , 63, and daughter Nilieshni Narayan, 33, found it very difficult. Those days are now are a thing of the past. Ms Wati, a diabetic patient and who has been using this once rundown wooden washroom in Benau for 41 years, looks after her daughter. Thanks to a locally-based charity group SUSPECT (Support Upon Society by Providing Economical Contribution Together) Friends Club which spent around $2500 to build a new washroom inside the house. They completed this within three weeks. Ms Wati said since the death of her husband in 2016, things had been more difficult for her and her daughter. “My daughter since birth is un­able to stand on her feet and walk like any normal being,” Ms Wati said. Last year this one-bedroom house was renovated by the La­basa Rotary Club. “Now we feel fully secure and thankful to all those who assisted us to live a decent life,” the moth­er of three daughters with tears in her eyes said. 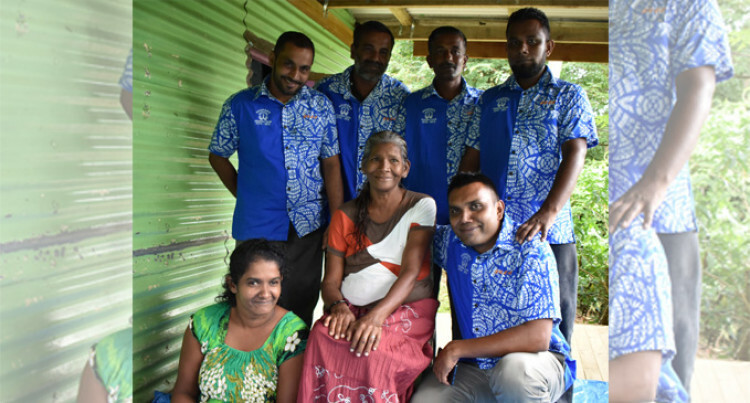 SUSPECT Friends Club vice-president Faiyaz Hussain said after reading this family’s need highlighted in the Fiji Sun, the club decided to assist. “We would like to thank our friends, families and donors who have assisted us to help this fam­ily,” Mr Hussain said. “We are a 19-member club and it was formed last year. “Every week during our meeting each member contributes $3 for charity. The club promised to continue assisting the poor and needy fami­lies.